The reason for this special linebreeding is to settle the good characteristics of both dogs stronger in the genes of the offsprings. 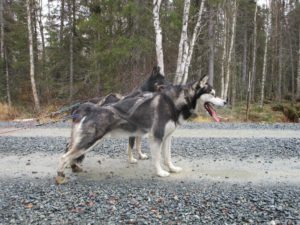 Both Ravn and Akka have Joki in their back ground, both are very good workers, leaddogs and above all very non agressive dogs towards other dogs. I would say typical Back To Work malamutes. If you think about a high energy dog, than Ravn definatly is, so High Spirit Ravn is a pretty correct choosen name for him. In the dogyard he lives with 4 other males 24/7 and never create problems even though he is loud, pushy and tough he avoid confrontations with the other males.. In body he’s a nice type, very good proportions in body lenght/legg lenght, not too long neither too short leggs. He’s 62 cm tall and about 36 kg. Correct angulated in rear and front. In team he usually runs in swing possition, but he can also run in lead. Next season I will train him as command leaddog. 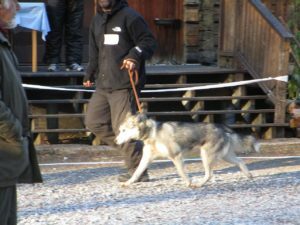 He’s an excellent trotter, powerfull but not extremely fast, let’s say a good malamute speed around 12 km/hour in the long run. His trotting range is between 6 and 15 km/hour. 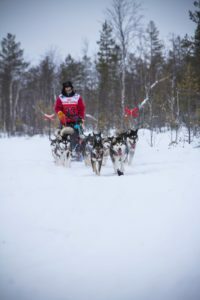 He was sellected for my Finnmarkslopet team 2019, but unfortunatlt had to cancel the race due to a serious car accident. Miki is much calmer in the mind than Ravn, until you hook her up in team than the working horse comes alive. She’s a very focused command leaddog. She has been like that from the first time I hooked her up in team. Miki can live with nearly all my other females in the dogyard. Shes 61 cm tall and 29 kg. Shes a fantastic trotter in speeds between 6 and 18 km/hour. Also she was sellected for the Finnmarkslopet team 2019. Back to Work High Spirit Knotte. (SE46561/2016) Smaller and lighter build female but with excellent proportions and angulation. 56-57 cm tall. 25 kg. Quite dominant and high energy female but no trouble maker. Lives 24/7 in the dogyard with 2 other females without problems and can run in team next to nearly all males and females. Short but dense coat and good feet. Health results: HD:A, ED:0, eyes clear. Pn non carriere, free by parents. Overall excellent health. Correct bite. Show results: ‘Very Good’ in junior class at Malamute specialty show in November 2017. Working results: Has ran 1366 km in trainings and some mid distance tourist tours in winter 2017-2018. In 2018-2019 she ran 1911 km and was sellected for my Finnmarkslop racingteam 2019. Very high will- to-go and high work drive. Working trotting speed 7-13 km/hour. Her natural gait is trot, never paces, sometimes a powerfull gallop when asked. She has run in all possitions in team, last summer and autumn she was often in lead and showed great potential. The male: White Fang Inditarot. 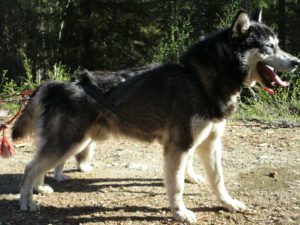 (SE52317/2010) Owned by Anci and Hendrik Emanuelsson from Cahppes Kennel. Strong build male, very well boned and good proportions. 64-65 cm and 40 kg. Rather calm and easy going male. Get’s along with most other males. Good coat and feet. Health results: HD:A, ED:0, eyes clear from heradity deseases. PN: non carrier, doesn’t carry the long coat gen. Correct bite. Show results: He is a showchampion and has won many dogshows, too much to all write them down. When interested in the details, just ask. Working results: Excellent trotter and worker. Working test 60, 2xworking test 100+ (Beavertrap trail) He has been Hendrik main command leaddog. 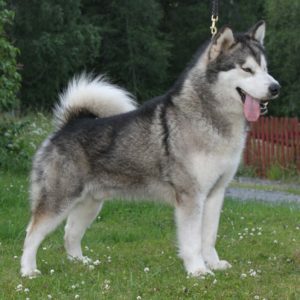 2 totally different types of malamutes combined can give interesting offsprings. 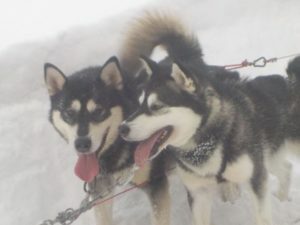 We hope to get offsprings that are right in the middle between the mother and the father in body type and energy level, while in the same time keeping their both good trot and good behaviour towards other dogs. In addition these will be the first Back to Work dogs that have the full 3 generation pedigree. We are looking forward to that breeding.